Palazzos are all things comfy and are a perfect fit for any event. So, we found these places where you can get yourself these pants starting INR 150. They may not have great interior decor but they have good collections and are budget-friendly. You can find all of them at one stop shop - namba T- Nagar! 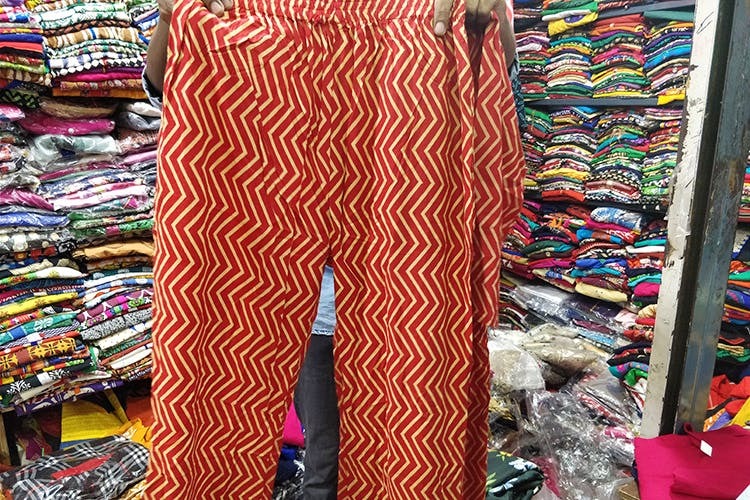 This store has cotton palazzo pants starting INR 200. Bright shades of plain colours like red, blue, and black are plenty here. They have palazzos with printed designs too. Try bargaining with the store owner for discounts! If you like florals, then this store has a lot of them. They have a good collection of different colours, and the palazzo material is comfy. The starting price is INR 250, but they will reduce it for you. All you need to do is ask! Just like their name, this store has a pretty cool collection. They have adorable popcorn and burger palazzos. They have plain colours as well, starting INR 200. Are you a Harry Potter fan? Then don't miss to ask them for their HP palazzo! Indie prints are a lot of fun these days. Head to this store for their palazzos with intricate and detailed designs. From camels to elephants, they have them all! The material is Jaipur Cotton and start at INR 200. Polka dots, stripes, and more, this store has the relax-at-home palazzos. We liked their multi-coloured palazzo that can be paired with a plain black T-shirt for a casual evening. Starting at INR 200, we walked out with big shopping bags.